Bird Key is quintessential Sarasota. An island set in the middle of Sarasota Bay, it was first developed by circus magnate John Ringling back in the 1920’s as a retreat for his own family. Today it glitters as one of the finest neighborhoods in town. Thanks to an extensive network of canals, more than two thirds of Bird Key’s 500 homes are on the water, many with dockage for large yachts. Spectacular views abound, both of the downtown skyline and of the lush mangrove islands that dot the bay. Bird Key enjoys what may be the best location in Sarasota. It is five minutes to the shops, restaurants, and cultural activities of downtown, and even less to glamorous St Armand’s Circle and the white sand beach of Lido Key. The Ringling Causeway, built in 2004, replaced a drawbridge and now offers convenient, unimpeded access to all the pleasures of Sarasota. The bridge also offers a perfect jogging path with a spectacular view of the city and the Bay. 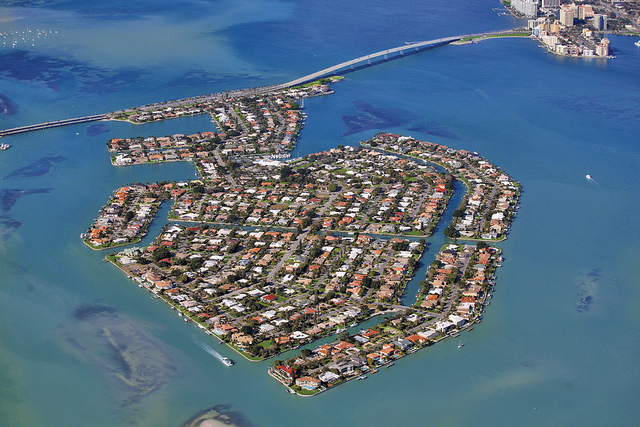 The fashionable manmade island neighborhood is a boater’s paradise that attracts an assortment of residents. Here, they discover the pleasures of waterfront living accompanied by the exceptional amenities of the Bird Key Yacht Club, which offers a unique social and recreational experience for its members and friends. Residences at Bird Key can be thought of in three categories – homes on the Bay, Canal homes and non-waterfront, Garden homes. Garden homes range from $515,000 to $1,399,000; Canal homes range from $1,195,000 to $2,695,000 and Sarasota Bay homes range from $1,499,000 to $9,490,000. Spectacular waterfront homes catch the attention of tourists and Sarasota residents alike on the east side of Bird Key. These amazing estates line the streets of Seagull Lane, East Royal Flamingo, Robin Drive and Meadow Lark Drive, offering magnificent views across Sarasota Bay and the downtown skyline. On the west side of Bird Key, you’ll also find stunning views – this time enhanced by blazing sunsets, Lido and St. Armands Key. To the south, there are again gorgeous water views overlooking the north end of Siesta Key, the south end of Lido Key and Big Pass. Simply, if you’re looking for an incredible Bay view, Bird Key’s many vantage points are nothing short of breathtaking. A boater’s paradise, Bird Key is adorned with wide, deep canals that make navigating the water a breeze. There are no bridges, inviting larger vessels to dock with ease. A short boat ride connects you with shimmering Sarasota Bay and the Gulf of Mexico. Peaceful water views enhance the leisurely boating lifestyle, and residents relish being able to hop into their boat straight from their backyard. For those who long to enjoy Bird Key’s unparalleled, prestigious Sarasota location, Garden homes are an excellent option. While not on the water, the homes still offer a slice of the island lifestyle, and have the added bonus of being surrounded by many grand waterfront estates.